My classmate James Felder of the category “James Felder” and the website Snapshot Artifact offers his take on Zozo’s Juice & Grille. It also happens to be James’s birthday—I’m joining him for a birthday brunch in less than 9 hours! Happy Birthday James! I ran into Zozo’s Juice & Grille walking back form a get-together of the writers one night. Zozo’s occupies the corner of Stanton & Orchard. Prime location. And it promised to be a great. It’s a sandwich shop by way of Rio de Janeiro, with an emphasis on steak sandwiches, which seem to be experiencing a neo-Philly renaissance in the Village. There also seems to be a renaissance of places that are “grilles” instead of “grills.” I think it means they charge more — the extra “e” is for expensive. That night, already full, I stopped in to have some of the mini-doughnuts, which they tout as a specialty. Greasy and stale. But it was late at night, and close to closing, so let’s make allowances. They also evidently have good ice cream, which would be a good resource now that my beloved NYC ICY is officially no more. The ice cream I have not tried yet. The next afternoon, Kirk, one of our fellow writers, and I had a late lunch/early dinner at Zozo’s. The place was as empty as the night before, but both visits were on off-hours. Evidentially they get crowded and there are service issues during peak hours. The space is great for people watching, long and narrow, totally open to the street during warm weather. You order at the counter from a friendly enough fellow and then take your food to one of the several steel tables. I had a beef sirloin sandwich with Chipolte pepper & avocado spread. Kirk had the beef sirloin sandwich blackened with Cajun mayonnaise. Kirk’s got a thing for mayonnaise that speaks deeply of how American his soul is. Kirk liked his, but thought it was overpriced for the amount of food you get. I agree, though I will gladly pay too much if the food is great — but this food isn’t (this is why the BBQ joint RUB blows on many levels). My steak was too thin and overcooked to have any meat taste or texture. I could have been eating marinated cardboard and it would have tasted the same. They offer filet mignon versions of the sandwiches for $2.50 more. I think this is abhorrent for a casual eatery. At Peter Luger’s or Nobu, fine. At a sandwich joint, no sir. We shared a side-order of buttermilk battered broccoli. It was okay. Anything can be okay if it’s deep-fried. And at the bottom of the paper cone it was in there was a deep pool of yellow grease waiting for us. Yuck. We each had a “fresh fruit shake.” This was their watery, unsatisfying take on a Batido. A real let down, friends. Overall, not terrible. But not worth the money or time. If you’re in the neighborhood and need meat, hit Houston Street: there’s Katz’s for hot dogs, the kebab corner place a block west, or that new mini-steak sandwich a block west of that next to the Sunshine Theatre (which I haven’t tried yet, but looks fun and MUST be cheaper). 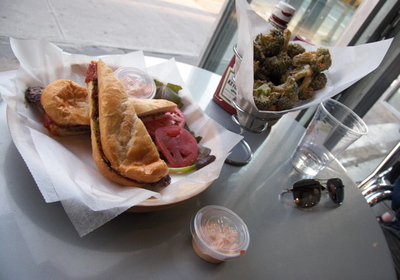 If you want a great Latin take on meat and bread, take a walk to Cafecito on Avenue C and 11th. It’s worth the trip. They have some of the best roast pork and Cuban sandwiches in town, and a Batido that will transport you to tropical climes even during the smoggiest, hottest NYC summer days.